Convert any waterproof container into an instant water feature using the Beckett Container Garden Pump and Fountain Kit. 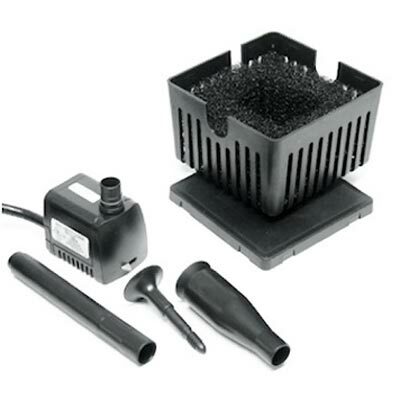 This easy to set up kit contains all you need to add moving water to your favorite planter or large vessel. The included statuary pump, foam prefilter, plastic casing, riser, and fountain head combine seamlessly for a striking fountain. The 90 gph pump has a flow adjuster on its front, allowing you to change the water flow to meet your needs. This pump rests on the square plastic mounting plate for stability, surrounded by foam to protect it from debris. A slit on the back of the foam accommodates the pump's 6' long cord. Place the hard plastinc casing over the foam, for added protection and an incomspicuous design. The included riser extends the outlet, and its top accommodates a fountain head. Both a trumpet and bell shaped fountain head are included, allowing you to create a customized look in your garden. Fully sumberge this kit and plug the pump into a GFCI oultet, so you can enjoy a personal water garden. Transform your containers into beautiful water gardens with this Container Garden Pump and Fountain Kit. One year limited warranty.